Anti-competitive practices are business, government or religious practices that prevent or reduce competition in a market (see restraint of trade). The debate about the morality of certain business practices termed as being anti-competitive has continued both in the study of the history of economics and in the popular culture. Dividing territories, an agreement by two companies to stay out of each other's way and reduce competition in the agreed-upon territories. Patent misuse and copyright misuse, such as fraudulently obtaining a patent, copyright, or other form of intellectual property; or using such legal devices to gain advantage in an unrelated market. Digital rights management which prevents owners from selling used media, as would normally be allowed by the first sale doctrine. It is usually difficult to practice anti-competitive practices unless the parties involved have significant market power or government backing. This debate about the morality of certain business practices termed as being anti-competitive has continued both in the study of the history of economics and in the popular culture, as in the performances in Europe in 2012 by Bruce Springsteen, who sang about bankers as "greedy thieves" and "robber barons". During the Occupy Wall Street protests of 2011, the term was used by populist Vermont Senator Bernie Sanders in his attacks on Wall Street. He said "We believe in this country; we love this country; and we will be damned if we're going to see a handful of robber barons control the future of this country." 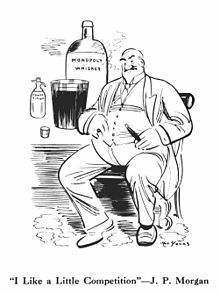 The business practices and political power of the billionaires of Silicon Valley has also led to their identification as robber barons. Monopolies and oligopolies are often accused of, and sometimes found guilty of, anti-competitive practices. For this reason, company mergers are often examined closely by government regulators to avoid reducing competition in an industry. Although anti-competitive practices often enrich those who practice them, they are generally believed to have a negative effect on the economy as a whole, and to disadvantage competing firms and consumers who are not able to avoid their effects, generating a significant social cost. For these reasons, most countries have competition laws to prevent anti-competitive practices, and government regulators to aid the enforcement of these laws. The argument that anti-competitive practices have a negative effect on the economy arises from the belief that a freely functioning efficient market economy, composed of many market participants each of which has limited market power, will not permit monopoly profits to be earned...and consequently prices to consumers will be lower, and if anything there will be a wider range of products supplied. Opponents of robber barons believe that the realities of the marketplace are sometimes more complex than this or similar theories of competition would suggest. For example, oligopolistic firms may achieve economies of scale that would elude smaller firms. Again, very large firms, whether quasi-monopolies or oligopolies, may achieve levels of sophistication e.g. in business process and/or planning (that benefit end consumers) and that smaller firms would not easily attain. There are undoubtedly industries (e.g. airlines and pharmaceuticals) in which the levels of investment are so high that only extremely large firms that may be quasi-monopolies in some areas of their businesses can survive. Many governments regard these market niches as natural monopolies, and believe that the inability to allow full competition is balanced by government regulation. However, the companies in these niches tend to believe that they should avoid regulation, as they are entitled to their monopoly position by fiat. In some cases, anti-competitive behavior can be difficult to distinguish from competition. For instance, a distinction must be made between product bundling, which is a legal market strategy, and product tying, which violates anti-trust law. Some advocates of laissez-faire capitalism (such as Monetarists, some Neoclassical economists, and the heterodox economists of the Austrian school) reject the term, seeing all "anti-competitive behavior" as forms of competition that benefit consumers. Anti-competitive practices of Apple Inc.
^ Michael Burgan (2007). J. Pierpont Morgan: Industrialist and Financier. p. 93. ISBN 9780756519872. ^ Bernie Sanders (2015). Outsider in the White House. Verso Books. p. 278. ^ Hanson, Victor Davis (17 August 2017). "Silicon Valley Billionaires Are the New Robber Barons". Retrieved 30 August 2017. ^ Motley, Seton (31 July 2017). "Silicon Valley Robber Barons Are Using Government As A Weapon Against Us". Retrieved 30 August 2017.